Breakthrough your weight training plateaus and enhance your strength goals with Limitless Excel Creatine. 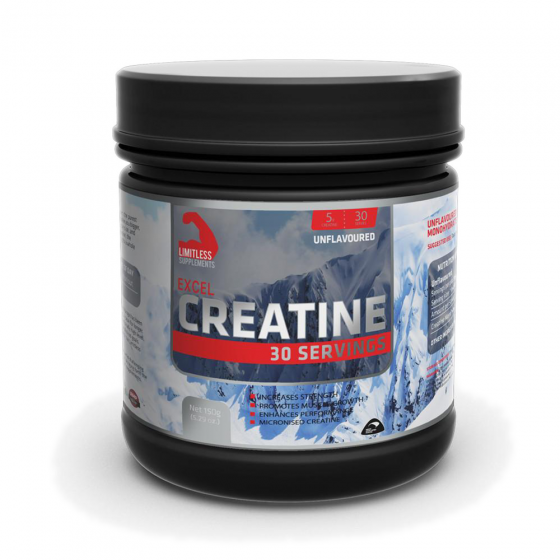 Made from the purest form of Creatine Monohydrate, Excel Creatine can help promote increased strength, muscle growth and improved recovery after those intense workouts. As a crucial part of the ATP muscle function, Excel Creatine also assists in delaying the onset of muscle fatigue, allowing you to train harder for longer. Achieve your goals and combine your regular exercise with Limitless Excel Creatine today!